This week, in Washington, D.C., Presidents Obama and Karzai will discuss a proposed Bilateral Security Agreement between Afghanistan and the United States. Presumably, they’ll note some of the main security problems Afghanistan faces. The people of Afghanistan have only seen cosmetic improvement in their living conditions. UNICEF reports that 36% of the people live in poverty and that over one million children suffer from acute malnourishment. According to available World Bank figures, about 73 percent of people in Afghanistan lack access to clean drinking water and 95 percent do not have access to sufficient sanitation. Limited access to medical facilities and the absence of knowledge, skills and the ability to effectively manage these diarrhoeal diseases usually leads to the death of 48,545 children each year, – approximately133 children per day. 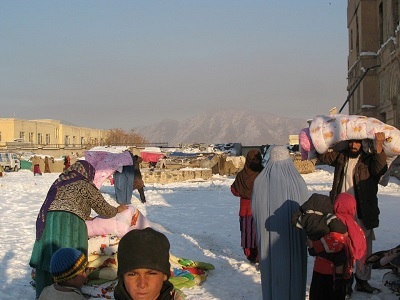 In and around Kabul alone, there are an estimated 35,000 internally displaced refugees , living in 50 camps. We’ve seen the wretched conditions there and walked away feeling ashamed of our warm clothes and easy access to food and potable water. Kabul appears secure, but it is merely a fragile “bubble” where people feel relatively removed from fighting, compared to areas of the country afflicted by regular Taliban and NATO/ISAF attacks. A young Pashto friend of ours spoke to us with frustration, yesterday, about how little understanding people in Kabul have for people in his province, called Wardak, where people live in constant fear of drone attacks and night raids. We are living here in Kabul, as guests of the Afghan Peace Volunteers. A former Voices delegation, from the UK, had asked our friend Raz Mohammed to answer, in a video interview, several questions about the conditions in his province. Raz’s message to the governments of the US and the UK is that he wishes they would regain their sense of humanity. We share Raz’s frustration over the lack of attention to crucial aspects of security in Afghanistan, including health care delivery, education, food security and shelter. The U.S. Congress doesn’t seem to believe in non-military solutions. The occupying powers here, and the Western media, are projecting an image benefitting few but the military-industrial complex of each participating nation. Over the past ten years of occupation, the United States could have assumed a responsibility to help establish a sustainable economy and infrastructure. Instead, although billions were spent, (in October, 2012 the office of the SIGAR (Special Inspector General for Afghanistan Reconstruction) released its 17th and latest report on reconstruction reported that after a decade of spending the U.S. government spending approaches the $100 billion mark) the U.S. forces will leave behind many millions of war-weary, exhausted and economically desperate people. Construction is supervised by a company called “Academi,” formerly known as Blackwater, a company which became infamous for previous convictions of employees who stole weapons from the U.S. military and killed Afghan civilians. Academi has been awarded a no-bid contract from the Pentagon to build a fortified armory, a fueling station, a vehicle maintenance facility, officers’ housing facilities, office space and a training center that will accommodate 7,000 elite troops, including Special Operations Forces. Scheduled to be maintained until at least 2015, “Camp Integrity” indicates that Special Operations and Counterterrorism operations will continue in Afghanistan, for the foreseeable future. “They were men who enjoyed demolishing Afghan houses, men who shot dogs in the face,” said Shea. A veteran of the U.S. war in Afghanistan, Graham Clumpfner, feels remorse over the night raids he participated in. “We could also see that when we entered a home, even if there wasn’t a terrorist there before, there was when we left,” he commented. Clumpfner now rejects any affiliation with war. We can’t help but wonder if former platoon members whom Neil Shea writes about could now be seeking job security with the Academi company. The Camp is promoted as a means to counter terrorism and build democracy. We’re not sure how to articulate emotional responsibilities for the U.S. general public toward Afghanistan. “We’re sorry, we’re so very sorry,” seems like a plausible start. But as regards building democracy, we believe democracy is based on education that leads to aware, compassionate and engaged global citizens. When regular media reports pay attention to the misery, hunger, desperation, anger and fear felt by millions of Afghans, or when U.S. people insist that they must have more comprehensive reports and analysis, and greater accountability for their tax contributions, then we’ll sense that democracy is being rebuilt in the U.S.
Afghans and Americans need a different practice of security that addresses basic needs and root problems. We need to clamor for a better world. – Kathy Kelly (Kathy@vcnv.org) and Martha Hennessy (marthahennessy@gmail.com) have been living in Kabul since December 20, 2012. They are representing Voices for Creative Nonviolence (www.vcnv.org) and are guests of the Afghan Peace Volunteers (ourjourneytosmile.com). Kathy Kelly contributed this article to PalestineChronicle.com. FNB, Hamas and Al Aqsa Saga: War on Terror in Johannesburg?